by Allison Rogers, Article donated by the mane points horse resource center. If you live in a state in the Chesapeake Bay watershed, chances are you've heard whisperings about nutrient management. One by one, Bay-state governments have been passing legislation requiring that qualifying landowners put such plans in place - Pennsylvania, Maryland, Virginia and Delaware all have new laws. This is not strictly a Bay phenomenon; states across the country are taking a look at protecting waterways. Washington is mulling new federal regulations. Few horse owners know what nutrient management entails. Rumors swirling throughout the Bay states have many concerned that Big Brother will make it impossible to keep horses. The truth is that nutrient management will affect owners in heavily populated areas near sensitive waterways. But compliance shouldn't be inordinately expensive or difficult, and it shouldn't prevent anyone from keeping horses. Even if your state doesn't yet require that you have a nutrient management plan, your pastures, your streams and your neighbors would all benefit from your doing so. Nutrient management refers to the controlled application of plant food to the soil through commercial fertilizers and manure. Fertilizer - including manure - contains nitrogen and phosphorus, two nutrients that, wrongly applied, can affect water quality. Pasture plants can only absorb so much of these nutrients, and excess may wash into nearby waterways. The goal of nutrient management legislation is to reduce the amount of P and N leaving the land on which they are applied. To achieve this, the regulations limit how much of these nutrients can be applied to fields. The details of each state's laws vary greatly; some limit nitrogen and phosphorus, some only nitrogen. Some include horses, some don't. Maryland's law - which at press time is the most complicated and inclusive - requires anyone with eight animal units (one animal unit equals 1,000 pounds of live-animal weight) to have a nutrient management plan. Because horses are designated as two animal units, anyone with four or more horses must comply. Plans must be updated every three years. Several key details of Maryland's legislation are still being worked out. Farmers have been using nutrient management plans for years. Getting a plan is fairly straightforward: Soil tests determine the levels of various nutrients, and a nutrient management adviser can analyze how these levels meet the needs of a target crop. If nutrient levels are higher than what's needed, the landowner is advised against adding fertilizer until nutrient levels have dropped. Local Cooperative Extension offices can help, as can Southern States' GrowMaster professionals. Of the Maryland stables that have developed nutrient management plans since the law was passed, the problem hasn't been the presence of too much nitrogen and phosphorus, but too little. Typically, horse pastures aren't fertilized and limed enough, even taking into account the manure left by grazing animals. What to do with stall waste presents more of a problem. Gone are the days of dumping manure in the woods for Mother Nature's disposal. Now you will have to account for how it is stored and what happens to it once it leaves storage. Waste management is complicated by the increasing urbanization of rural areas: Where once your barn was isolated, suddenly neighbors are peering over your fences, wrinkling their noses. The last thing you want to do is invite complaints by having a messy, smelly manure pile. The local Soil and Water Conservation District can advise you on the best location for a manure pile. If you have enough horses and stall waste to warrant building a manure storage structure, the SWCD can design it for you at no charge and help you determine if you qualify for cost-share dollars to offset construction costs. Creative ideas for manure management will be addressed in the next issue. Get a nutrient management plan, and follow its recommendations. If your pastures need lime and fertilizer, don't be afraid to apply them; the healthier your pastures, the less runoff that will occur. Not only does grass absorb nutrients from the soil, it also acts as a physical barrier to prevent runoff. Take care of bare spots. Take horses off grass that has been grazed below three inches, and don't let them back on that grass until it is six inches high again. Keep horses off wet pastures as much as possible. In winter, always keep hay in the pastures to discourage horses from grazing grass that is dormant and can't rejuvenate. Clip pastures regularly during the growing season to keep weeds under control. Mowing also promotes more even grazing by cutting back older, less palatable grass. Drag pastures to break up and spread manure. This not only makes more of the nutrients available to grass, it also helps kill parasites. Pile manure and stall waste as far from water sources and neighboring houses as possible. Cover manure piles with a tarp during wet weather. Compost manure and spread it on gardens or croplands or have it hauled away. 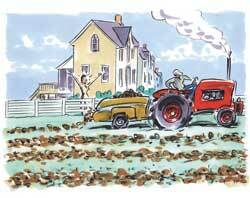 If you spread manure on your property, do so only during the growing season. Don't spread when the ground is frozen and can't absorb the nutrients. Read the next horse farms article on Selling a Horse.